​Hockey is in our blood. We are in season. Check our schedule for games. Come out for our home games. 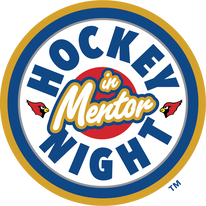 Each night, 5 lucky Mentor Student Fans will receive a FREE Hockey Night In Mentor T-shirt. Come out for exciting game action, energizing music, and our traditional Chuck-A-Puck contest after the second period! CARDS HOCKEY BRINGS BARON CUP HOME TO MENTOR!! It's official! We are back in our Locker Room. The City of Mentor, the Mentor School District, and the BlueLine Club worked out an agreement that allows Mentor High School Hockey to utilize designated space at the Mentor Civic Arena for the team's locker room. The City of Mentor has requested the mentor high school hockey team to vacate our locker room in order to store arena equipment, chemicals and supplies. Our booster club built the locker room 24 years ago with a permit from the city. Interested to know the story?​ Click here. Mentor Victorious over Lake Catholic in Annual Holiday Classic ! !